Stoney Middleton genealogy tells us much about the local history of the village as well, as one traces the professions of the locals over time. 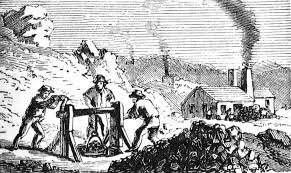 In the 1600s, most citizens were either farmers or involved in some way with the lead-mining trade. In the 1700s, one starts to see more small business owners, such as grocers, publicans, and carpenters, and by the late 1700s and into the early 1800s, the Industrial Revolution was in full swing even in rural Stoney Middleton, as many locals became involved in the cotton weaving trade and especially in the manufacture of boots and shoes. Public houses and farms remained major sources of employment in the 1800s, in addition to the local mines, and the gritstone quarrying and lime burning industries seem to have come into their own in the 1800s. Records in the 1800s also indicate the presence of many workers related to the transportation trades: blacksmiths, coachmen, grooms, ostlers, and “common carriers” who made local cart runs up to the city of Sheffield and to area towns and villages. Moreover, the 1800s saw wealthier families residing at least part-time in the village and in surrounding towns, which brought about the presence of more servants in the area: gardeners, butlers, cooks, housemaids, nursery maids, and ladies’ companions. The 1800s also saw the great growth of paved roads and of the railways, with Stoney locals getting involved in those businesses as well. Knowing the family history of Stoney area families can tell us much about the workings of the various businesses in the town and in the surrounding farms and dales, and thus contribute much to our knowledge of the area’s local history. For instance, families were often in the same trades across generations, and knowing family history can help trace ownership of farms and public houses and distinguish among branches of a family who followed different trades.